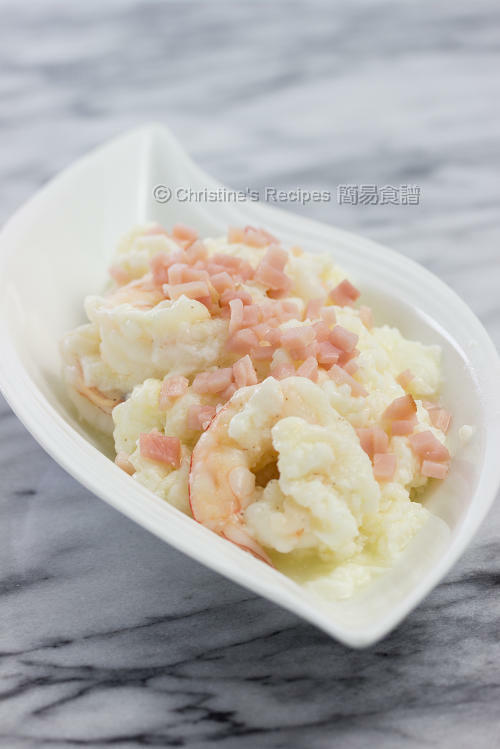 Having had the popular stir-fried prawns with eggs for countless times, I decided to detour and make a similar dish only with egg whites. 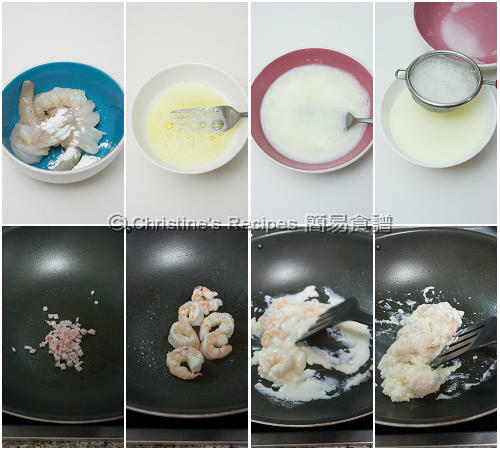 The verdict was that I loved to pan-fry prawns with egg whites again and again. It’s tasty and nutritious. I sprinkled some fried crunchy bacon dices on top, adding a depth of flavour. This dish is quite small in size. You might like to double it up for your family. The leftover egg yolks can be used for making this dessert for wrapping up your dinner. Mix the prawns with the marinade, for about 20 minutes. Rinse with water and pat dry with kitchen papers. Season with salt and pepper. Set aside. Heat a little of oil in a frying fan. Saute the bacon. Transfer onto paper towels to absorb the excess oil. Heat a little more of oil to pan fry the prawns until cooked through. Set aside. Whisk the egg whites. Stir in the milk. Drain through a fine sieve to remove the foam. Add in the prawns. Heat oil over medium high heat. Then reduce the stove heat to very low or you might like to turn it off. Wait half a minute. Then pour in the egg white mixture. Lightly push the mixture forward with a wok shovel or spatula. You’ll see the egg whites slowly cooked and come together. Sprinkle the bacon on top. Serve immediately. Make sure that low stove temperature is used. Or the egg whites will easily be burnt, turn tough, or can’t retain its white colour. By slowly pushing the egg whites forward, it helps them coagulate layer by layer and form like a cloud texture. To get the best results, try to use fresh prawns. I used corn flour (corn flour) and salt to marinate for a while, then rinse them with water in order to make the prawn meat smoother. 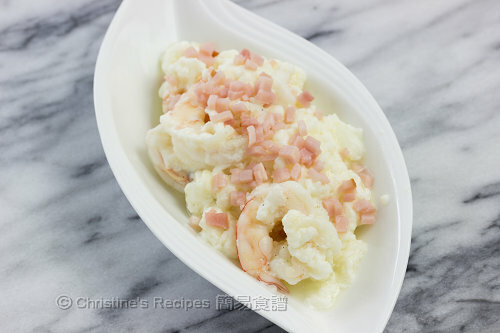 Is this like 赛螃蟹 a dish cooked with fish meat and egg white? It's quite like 赛螃蟹, because the main ingredient is egg white. I had this before, so I know this is really delicious. Yeah, this dish is so delicious, Angie. I just cooked this and it got the thumbs up from my picky gal! So i want to thank you for sharing this recipe. Yay, I'm so happy for you too, Esther.